The next day we went for a trek. Daniel had been sick in the night, so I went with Gal (aged 14) and Eitan (aged 6). 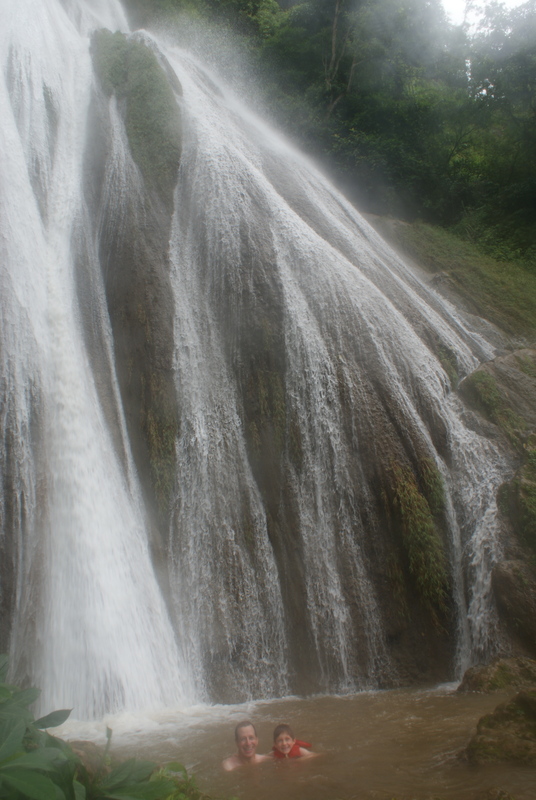 We chose to do the waterfall trek with a guide, which is essentially a hike through the rice paddies to a waterfall not far out of town – about a 3 hour roundtrip. 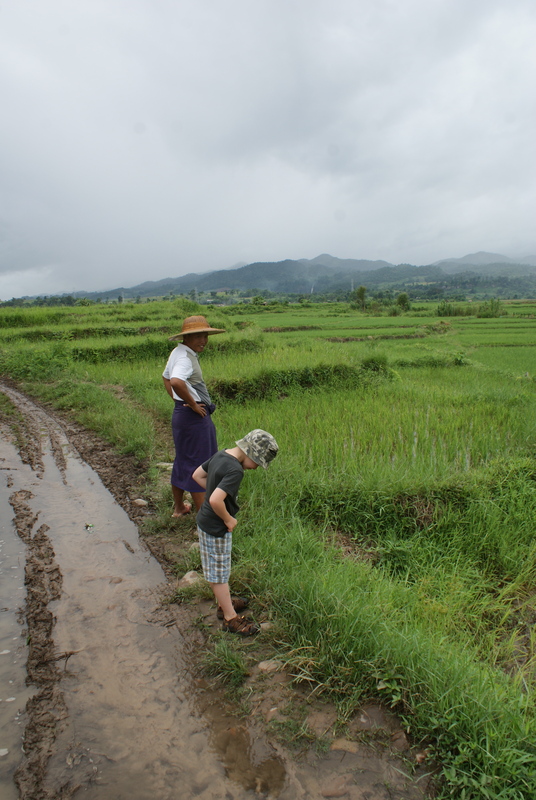 The views were amazing – verdant paddy fields everywhere. About an hour into the trek it started pouring with rain – we just kept on walking, but the dirt path quickly became very muddy and it was easier almost to step off the path and walk in the little streams running alongside. Eventually we made it to the waterfall. Not as spectacular as the Anisakan Falls, but pretty good. I had brought along our bathing suits as well as a kid’s life jacket and Eitan and I decided to take the plunge. We had a great time, though only afterwards did I learn that maybe the swim was a bad idea – in the rainy season all kinds of things get swept into the water, and we had been swimming in it! I feared that we might pick up giardia or worse but luckily we didn’t. The way back was even muddier than the way there and we slipped and slid our way back to town. Beautiful, but clearly it ‘s better in the dry season! This is probably the same for trekking in the Kalaw region – supposedly wonderful, but perhaps less so in the monsoon. Later that afternoon we explored the town further. Daniel was feeling much better and we went for a walk to see more of the “highlights” on our little map. We visited the goldsmith, who turned out to be an incredibly friendly guy – we toured the little store, saw some jewelry being made, and then he gave both boys a ring of silver each but we still don’t understand why he didn’t give one to Gal (our daughter) as well? We then went for tea at a tea shop. The tea shop is part of life in Myanmar. You’ll find them in every town, and as soon as you sit down you receive a pot of tea and some cups. You can sit there for hours, drink tea, eat donuts and samosas and enjoy. 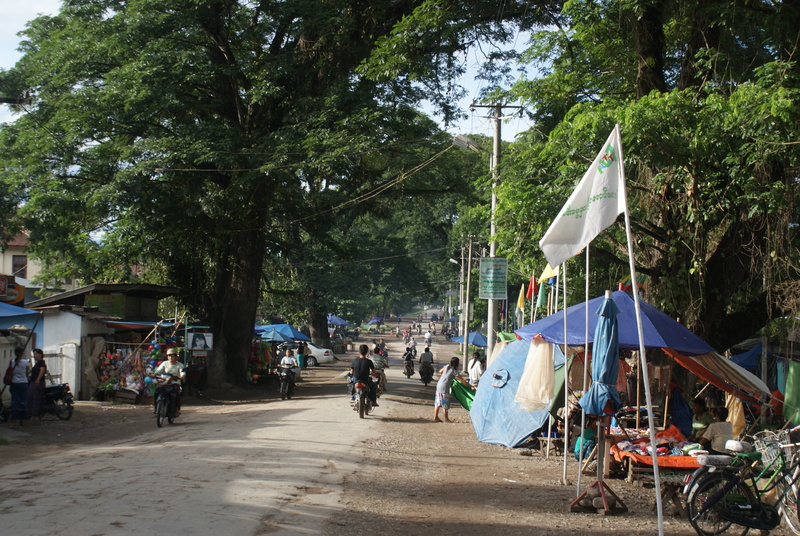 Often, there is a TV where people come to watch soccer games, and in Hsipaw, there was a ping-pong table, where people came to play whenever they felt like it. I loved the sweet milk tea – I could drink many cups at a time. Sitting at a tea shop watching Myanmar life go by is one of the great pleasures of any trip to Myanmar.